Please contact us for current custom quote. With more than 12,000 square feet of indoor and outdoor hospitality space, the Executive Club on Azalea is a multi-level climate-controlled facility constructed exclusively for hospitality during the Masters Golf Tournament. The Executive Club is maintained by attentive professional event staff. Daily access from 7 a.m. until 7:30 p.m. The Country Inn & Suites, Augusta is the perfect place to stay whether you are coming in to town for the Masters Tournament. With the friendly service, personal touches and warm country-style décor, it it sure to please business and leisure travelers alike. The hotel is located 2 miles from Augusta National. Leisure travelers enjoy our Augusta hotel's location because it is just a mile from the Augusta National Golf Club. Visitors can enjoy plush amenities that include an on-site putting green, fitness center, convenience store, and a complimentary hot breakfast buffet daily. It is less than 3 miles from the Augusta National Golf Course. The Augusta Marriott Hotel and Suites is ideally located in the heart of the downtown business district, on the banks of the Savannah River. Guests of the elegant hotel enjoy being close to shopping, entertainment and cultural attractions and less than 5 miles from the Augusta National Golf Course. The newly renovated Doubletree Hotel Augusta is an ideal destination for discerning business and leisure travelers who demand excellence. It is located 4 miles from the Augusta National. For more than a century, The Partridge Inn has served as a tranquil retreat for heads of state, captains of industry, international celebrities, and other luminaries. Established in 1892, this historic, full-service choice among Georgia hotels has undergone a multimillion-dollar renovation -- perfectly blending its richly vibrant past with the modern comforts and amenities you've come to expect from a luxury property. The hotel is located two miles from Augusta National. Set along the banks of the Savannah River,The River Golf Club has established itself as one of the premiernew course designs in the Southeast. Voted #1 private golf course in the Augusta area for 3 years in a row, our Eagle greens run 10.0-10.5 on the stimpmeter. Water comes into the play on 7 of the 18 holes. The Jones Creek Golf Course is built on a superb site, ideal for a world-class golf course, The challenge of Jones Creek has been created by incorporating the existing vegetation and streams as well as utilizing other natural conditions. The 18-hole course offers five sets of tees and regardless of which tee you choose every single hole is a wonderland of golf risk and reward. Private House with Personal Chef: We can arrange to have a personal chef come and prepare all of your meals for you. Private Dinners at The Executive Club: We can reserve a private party for you and your guests within our luxurious Executive Club facility. 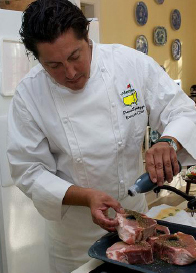 Local Restaurants: we have access to reservations to many of the local restaurants that are usually booked solid during Masters week. If you are unfamiliar with Augusta, we will be able to make the best recommendations possible.